Pontiac City Hall is located at 47450 Woodward Avenue, Pontiac MI 48342; phone: 248-758-3201. 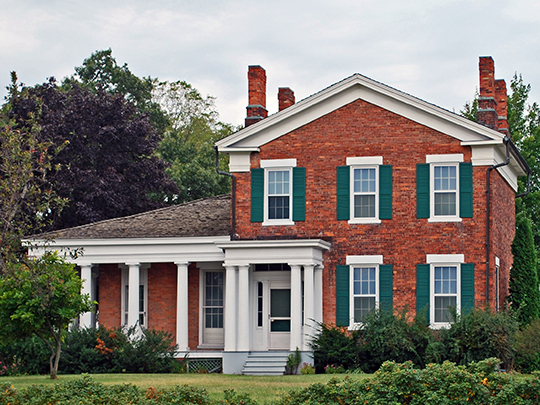 Photo: Wisner House (Governor Moses Wisner House), ca. 1845, 405 Oakland Avenue, Pontiac, MI. Listed on the National Register of Historic Places in 1970. Photographed by User:Andrew Jameson (own work), 2010, [cc-by-3.0 (creativecommons.org/licenses/by/3.0)], via Wikimedia Commons, accessed March, 2014. The Village of Pontiac was not incorporated until 1837, but it had an existence as a growing settlement from the time of the formation of the Pontiac Company by Stephen Mack, of Detroit, on November 5, 1818. In 1827 Pontiac was organized as a township. It was incorporated as a city in 1861. The first settlers were undoubtedly Colonel Stephen Mack, Major Joseph Todd, William Lester and Orisen Allen. Together with a body of workmen located here in November or December of 1818. In 1819 Calvin Hotchkiss and Jeremiah Allen entered lands in the vicinity; that year also witnessed the coming of Harvey Williams and Elisha Gardiner, the first blacksmiths of the place who worked in the old shop built by Colonel Mack. Among those who came in 1820 and 1821 were Charles Howard, Oliver Parker, Captain Hervey Parke, Judah Church, Abner Davis, Eastman Colby, Alexander Galloway, Rufus Clark, Enoch Hotchkiss, James Harrington, G. W. Butson, John Edson, Joshua S. Terry, Joseph Harris, Stephen Reeves and Captain Joseph Bancroft. The firm of Mack, Conant & Sibley (Judge Solomon Sibley was a silent partner) made the first improvements in Pontiac. They obtained from the Pontiac Company the title to the water power, in consideration for which they agreed to pay a bonus of $1,000 toward the erection of county buildings, in case the county seat could be located in Pontiac. The company itself also donated certain lots as an inducement for such location, and reserved various sites for schools, churches and a cemetery. Thaddeus D. Seeley, History of Oakland County Michigan, Volume I, The Lewis Publishing Company, Chicago, 1912.